The founder and King of Goldoa. He is a living legend, who has continued to rule over Goldoa for its 635 years of history. He is the father of Rajaion, Almedha, and Kurthnaga. 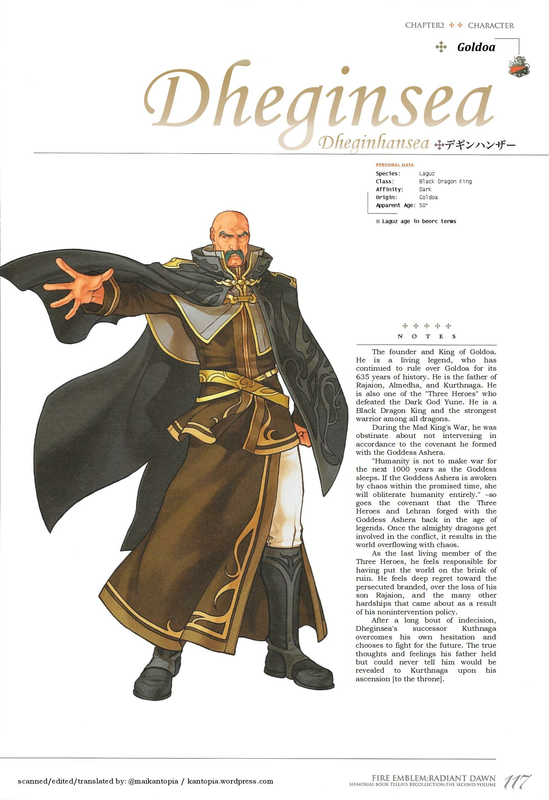 He is also one of the “Three Heroes” who defeated the Dark God Yune. He is a Black Dragon King and the strongest warrior among all dragons. During the Mad King’s War, he was obstinate about not intervening in accordance to the covenant he formed with the Goddess Ashera. “Humanity is not to make war for the next 1000 years as the Goddess sleeps. 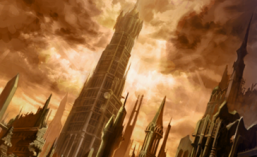 If the Goddess Ashera is awoken by chaos within the promised time, she will obliterate humanity entirely.” –so goes the covenant that the Three Heroes and Lehran forged with the Goddess Ashera back in the age of legends. Once the almighty dragons get involved in the conflict, it results in the world overflowing with chaos. As the last living member of the Three Heroes, he feels responsible for having put the world on the brink of ruin. He feels deep regret toward the persecuted branded, over the loss of his son Rajaion, and the many other hardships that came about as a result of his nonintervention policy . After a long bout of indecision, Dheginsea’s successor Kuthnaga overcomes his own hesitation and chooses to fight for the future. The true thoughts and feelings his father held but could never tell him would be revealed to Kurthnaga upon his ascension [to the throne]. This entry was posted in Artbook, Fire Emblem, Translation, Video Games and tagged background, character, character design, concept art, dheginhansea, dheginsea, Gamecube, guidebook, intelligent systems, japanese, memorial book, nintendo, path of radiance, radiant dawn, tellius recollection, Trivia. Bookmark the permalink.